It seems like every year we either buy or are given marshmallow Peeps. We think they are just soooo cute. However, no one seems to actually want to eat them! 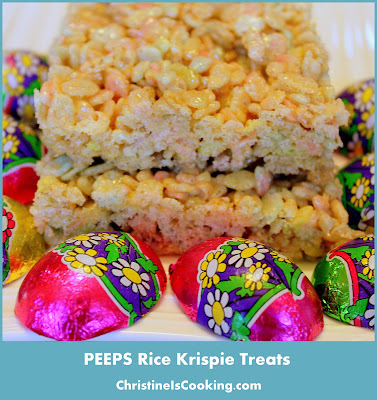 I didn't want to throw them out so we decided to re-purpose them into Rice Krispie treats. The end result was pretty yummy. They passed the kid test with flying colors!! I stretched the marshmallow as far as I could and added a little extra butter so that the treats would still hold together, but wouldn't taste too overwhelmingly sweet. (1) Melt the butter in a non-stick pan over medium heat. (2) Melt the peeps in the pan. If you are using multiple colors; keep the colors together in separate areas of the pan. The peeps will pretty much melt themselves so no need to stir a lot. (3) Once melted, remove the pan from the heat and add the cereal. Stir until incorporated. (4) Pour the mixture into a 9x9 lightly greased pan. (5) Pat down into bar form using plastic wrap. (5) Let chill in the refrigerator at least 30 minutes before serving.